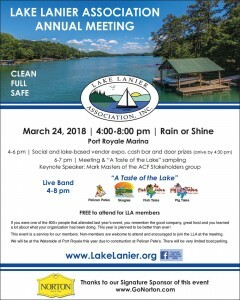 A day of threatening weather turned sunny just in time for the annual meeting of the Lake Lanier Association on March 19. Held at Port Royale Marina, the obvious draw – more than 400 people preregistered – was the fish fry prepared by the Lanier Crappie Club. The fresh catch yielded more than 1,600 crappie filets that were hand-breaded, deep fried and served to the crowd that gathered at Pelican Pete’s restaurant. Members cooked fried fish and what seemed like thousands of hush puppies for most of the afternoon to get ready for the meeting. Adopt-a-Lake – initiated in 2000, the program tests 25 stations each month, reporting on weather, water clarity, temperature. Twenty-four volunteers also filter water samples to check for chlorophyll a presence. Rip Rap Initiative – from a recent University of North Georgia study of 21 islands around the lake, research showed that there’s an average loss of 11 percent due to erosion. The 2015 pilot program at Three Sisters Island will be followed by four projects near these landmarks in 2016: Van Pugh, Aqualand, Browns Bridge and Forsyth County Island. Solar Lights – as of a December 2015, 186 lights have been installed on hazards around the lake, mostly below Browns Bridge. In 2016, the association plans to install another 120. Safe Lakes – the association has established a monitoring and maintenance program, contracting with Solar Services of Georgia, which will inspect lights monthly and use an automated status database. Shore Sweep – the event is more successful than ever before with the advance collection and the use of the TrashOut app that allows users to photograph and mark trash with GPS coordinates for pickup by volunteers. The app is free. In 2015, more than 50 tons of trash, debris, Styrofoam and other scrap was removed from the lake. The 2016 event will take place on September 24 with 12 Shore Sweep sites. The group has asked for more volunteer boat captains to assist in this year’s clean up. Wilton Rooks spoke about the work of the AFC Stakeholders organization and the ongoing pressures on the lake as a result of growth. But perhaps the best part of the meeting – at least to those in the association who have diligently worked on this project for the past several years – was that the Georgia Legislature has allocated $25,000 to assist with the removal of abandoned boats in 2017. “Abandoned vessels have been a major concern for us, and while we’ve been able to accomplish a great deal thanks to many businesses working with us, this funding will help us even further,” said Joanna Cloud, the group’s executive director. During the meeting, the association showed photographs of seven abandoned vessels that have been removed from the lake since the program began. Four other high-risk vessels are on the list for removal, although funding has been a challenge. 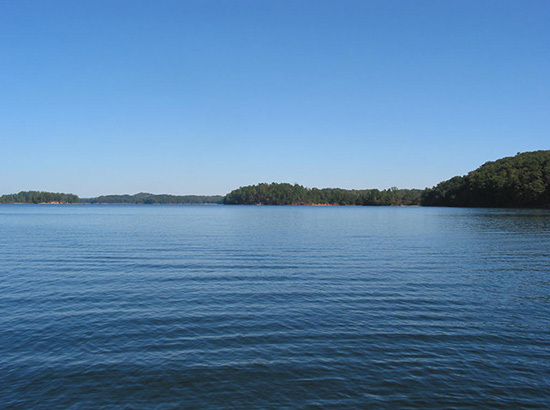 Be sure to mark your calendar for the 2015 Lake Lanier Association Annual Meeting. We have made some changes to the format of the meeting and are very excited about the event this year! Drive by car, or by boat. If by boat, park at the courtesy dock at Port Royale and walk up to the meeting. The Lanier Crappie Anglers Club will be doing a FISH FRY as heavy hors d’oeuvres for us. This is a really yummy way to experience Lake Lanier! 4:00PM-5:00PM will be a social hour and lake based vendor expo*. Cash bar will be available. Door prizes will be given away! You must be there by 4:30PM to get a door prize ticket. 5:00PM-6:00PM food will be served and the official meeting will take place. The meeting agenda will include updates on the different lake based programs and services from the LLA. 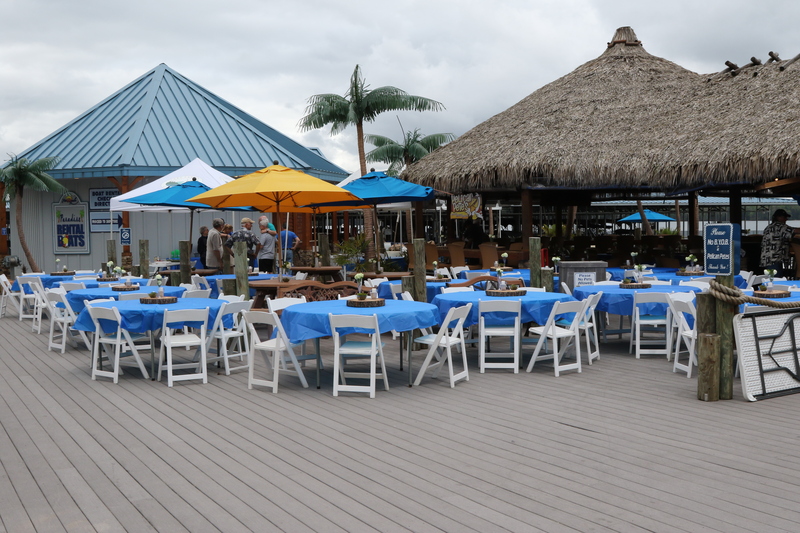 After the meeting is over, you are welcome to walk down to Pelican Pete’s restaurant to hear live music and enjoy food or beverage. 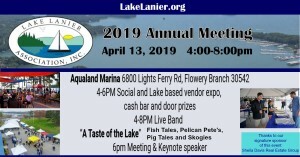 *Current Lake Lanier Association business members are welcome to participate in the vendor expo at no charge, but you must RSVP to participate in the vendor expo. Send us an email at lakeinfo@lakelanier.org if you would like to be an exhibitor at the vendor expo.